At Shopanthropic, our goal is to provide ‘feel good’ products to mainstream consumers. Drawing inspiration from the latest styles and trends around the world, we aspire to provide sustainable fashion and lifestyle products. This sustainability can come in many forms, whether that be something that is socially-made or eco-friendly, or even organic and natural. The concept that people can have a significant positive impact on the world through the purchasing decisions they make is something that is relatively new to society. Consequently, we realize that it isn’t an easy journey to create this change in people’s mindsets. So we believe the purchase of every product we provide is helping enable change somewhere around the world. It might be an eco-friendly paper journal made with cruelty-free leather that is helping improve the environment, or a hand-crafted necklace, where every sale is enabling an artisan to finally use their crafts to improve their lives and their communities, but they all have an impact. We aspire to help the artisans we work with be sustainable and endure against the odds the face in the poverty cycle, in the hopes that one day they will rise above it, and sustainably support their communities. We aspire to protect the environment by creating products that are more sustainable that will the environment endure the current crisis, in the hopes that small steps like purchasing a product will cumulate into a sustainable difference. We aspire to provide organic or natural products that allow mainstream consumers lead a more sustainable lifestyle that will endure as the trends and their tastes change, in the hopes that this creates a sustainable culture that transfers into all aspects of their life. While some products are socially-made, others are eco-friendly and yet others are both – each product has an amazing story, purpose and impact tied to it. Explore our collection and help us enable change everywhere. To celebrate Earth Day 2011, we are dedicating a collection of sustainable products from our Home, Gifts, and Fashion collection to raise funds for Evergreen, a Canadian charity whose objective is to make cities more livable. In the month of April, 25% of proceeds from each sale of products from this collection will go towards supporting Evergreen’s projects in greening Canadian cities. Evergreen is empowering Canadians to create and protect green spaces in Canada’s urban municipalities while insuring quality of life and economic health. Since 1991, Evergreen has worked to bring nature back to our cities and towns with funding, plant resources and nurseries, expert advice and organizing capacity. Evergreen works with schools, municipalities, conservation authorities, neighbourhood associations and many other community organizations on a broad range of greening and community-building projects. • Five years of greening at Westwood Elementary school in Prince George, B.C. From school grounds to parks, from vacant lots to corporate grounds, Evergreen is involved in greening projects. You can visit Evergreen’s Project Registry to find projects in your community that have already registered. This April, purchase a sustainable product from our Earth Day collection and we’ll contribute 25% of retail price to Evergreen. Help us help Evergreen in their endeavours in assisting Canadians in their projects for bringing nature to our communities. Besides our wood-free & cruelty-free leather journals and sustainable jute clutches and bags, we are also featuring another style of cotton stoles that are a part of our Earth Day collection. In celebration of Earth Day 2011, we will contribute 25% of retail price of this stole to Evergreen, a Canadian charity whose objective is to make cities more livable. By empowering communities and by providing innovative resources & grants, Evergreen is working towards conserving, regenerating and sustaining nature in urban environment across Canada. These stoles are hand-embroidered and 100% cotton. 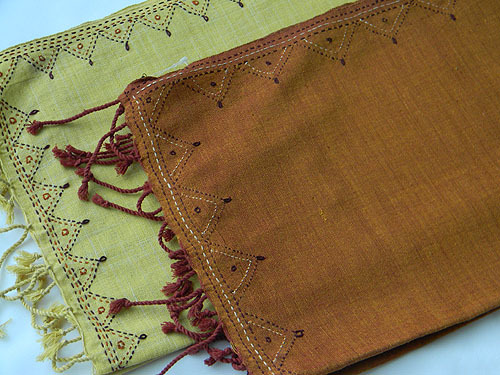 The material is coloured with natural dyes making it environmental-friendly. Besides, being a 100% natural dyed product, these stoles are socially-made too. This product is made through the cooperation of a women’s enterprise in the state of Rajasthan, India and the intent of this project was to provide an alternative means of livelihood and income augmentation for the women of rural, tribal and urban slums of the region. By using traditional techniques of ‘Tanka’ embroidery these artisan women are reflecting their creativity, imagination and passion in each piece they are creating and with the support of the women’s enterprise these artisan women have earned significant financial and social independence and status within their family and society. By purchasing this stole you are helping improve the lives of women artisans, and are helping us help Evergreen in their endeavours in greening Canadian cities. To celebrate Earth Day 2011, we are dedicating a collection of sustainable products from our Home, Gifts, and Fashion collection to raise funds for Evergreen, a Canadian charity whose objective is to make cities more livable. In the month of April, 25% of proceeds from each sale of products from this collection will go towards supporting Evergreen’s endeavours in greening Canadian cities. Evergreen was launched in 1991 and since then through their collaborative approach and extensive partner network, they are collaborating with thousands of Canadians coast to coast and working with individuals, municipalities, stewardship groups, community organizations, businesses, schools and other landowners to bring nature to cities through planting, habitat stewardship and community gardening. Besides providing various resources, they are helping Canadians through funding and grants in bringing nature to communities in every corner of the country. Additionally, Evergreen is providing a list of organizations that provide further opportunities for funding greening projects. Besides providing grants, Evergreen encourages Canadians to raise funds for their greening projects. Evergreen suggest Canadians to turn first to their own community for funding and contact local clubs as well as local businesses for contributions of in-kind goods, services and cash donations. This April, purchase a sustainable product from our Earth Day collection and we’ll contribute 25% of retail price to Evergreen. Evergreen is one of Canada’s leading funders of community and school greening projects. So far they have provided over $5.7 million to more than 2,500 projects across Canada, ranging from wetland restoration to school ground food gardens. This eco-friendly jute shopping bag is a part of our Earth day collection. In celebration of Earth Day 2011, we will contribute 25% of retail price of this bag to Evergreen, a Canadian charity whose objective is to make cities more livable. Since 1991, Evergreen has worked to bring nature back to our cities and towns with funding, plant resources and nurseries, expert advice and organizing capacity. Jute, a fiber called ‘hessian’ in North America, is a natural, highly affordable, versatile, biodegradable and renewable fiber. Jute is known to have characteristics like high intensity, long durability, fire and heat resistance, and silky luster & texture. Traditionally Jute fabric, known as ‘burlap’ also, was used to make products like sacks and ropes. With recent technological advancements, Jute fabric is now used in making a variety of products including fashion accessories, bags, rugs, and table linens. This is a sturdy, multi-purpose, and inspirational jute bag. 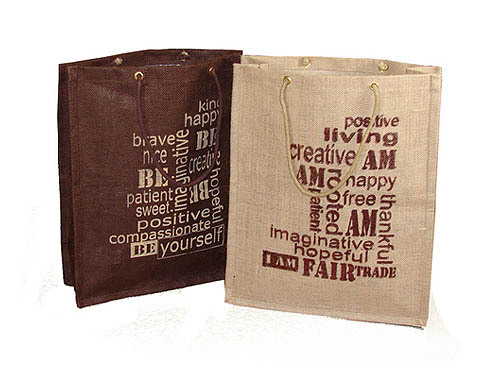 Besides being a 100% sustainable product this jute bag is a socially-made and fair-trade product too. This bag is made following fair trade practices by rural artisans in Southern India. This means that the artisans were compensated fairly for their work and this product is supporting artisan community and empowering women. This bag is a perfect piece for eco-shoppers. By purchasing this bag you are supporting the environment, helping improving the lives of the artisans, and helping us help Evergreen in their endeavours in improving the health of our cities – now and for the future. Evergreen is empowering Canadians to create and protect green space in Canada’s urban municipalities while guaranteeing quality of life and economic health. Ready access to the best resources is a big part of that mandate. They cover everything from getting people together in your community or school to planning and design, planting a garden to managing your volunteers. You can view or download Evergreen publications, conference reports, workshop proceedings, teacher resources, newsletters, and much more from their website. This April, purchase a sustainable product from our Earth Day collection and we’ll contribute 25% of retail price to Evergreen. Step up and help us help Evergreen in their endeavours in empowering Canadians for greening urban communities. This Baroque Pearl Pendant necklace is a part of our Earth day collection. In celebration of Earth Day 2011, we will contribute 25% of retail price of this necklace to Evergreen, a Canadian charity whose objective is to make cities more livable. By empowering communities, by providing innovative resources and by transforming educational values, Evergreen is bringing communities and nature together for the benefit of both. This necklace has a Baroque pearl pendant. Baroque pearls are unique forms of pearls because of their exquisite natural form and have an irregular shape. Cultured freshwater pearls are most commonly Baroque, because freshwater pearls are mantle-tissue nucleated instead of bead nucleated. Thus these pearls are rarely perfectly spherical and can appear in irregular shapes. Baroque pearls were highly prized by Renaissance jewellers, who saw them not as misshapen products of sea mollusks but rather considered them unique and exquisite. Pearls are considered to be eco-friendly gems because pearls don’t require mining, pearls don’t require any chemical leaching, and most of all, pearls are found in mollusks which are used to culture pearls and these mollusks depend on a relatively stable environment and clear water in order to develop. 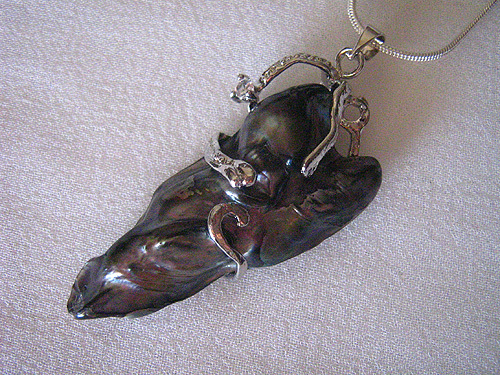 This Baroque Pearl pendant is made by a small artisan group in East Asia. By hand-wrapping stone in metal-finish frame, these artisans are creating exclusive pieces using their imagination and earning their livelihood. By purchasing this necklace you are supporting the environment and helping us help Evergreen in their endeavours in greening urban communities. Evergreen’s most innovative project to date, Evergreen Brick Works is a stage and incubator for Evergreen’s programs to bring nature close to communities. Evergreen has transformed the former Don Valley Brick Works from a collection of deteriorating heritage buildings into an international showcase for urban sustainability and green design. In 2010, Evergreen Brick Works was named as one of the world’s top 10 geotourism destinations by National Geographic. Evergreen Brick Works is a community environmental centre for education programs that foster the relationship between nature, culture and community through experimental learning, collaboration and fun. Through this program, they are inspiring school groups, families and individuals to learn and then integrate these experiences into their daily lives to build a culture of caring for nature. To make this experience more interesting they are providing kid activities, art activities, yoga, movement & meditation, and farmers market on-site. Evergreen Brick Works program is addressing a range of social and environmental challenges and by providing innovative programs and facilities they are extending the reach of charities, non-profit organizations and socially conscious private enterprises working on these issues. Working collaboratively with some of Canada’s leading non-profit organizations, Evergreen Brick Works is providing visitors opportunity of experiencing nature in the city. As our cities are facing more and more challenges every day due to increasing poor air and water quality, degraded natural environments, and deteriorating public infrastructure, Evergreen is helping Canadians in finding the solutions. This April, purchase a sustainable product from our Earth Day collection and we’ll contribute 25% of retail price to Evergreen. Support us help Evergreen in their endeavours in improving the health of Canadian cities. Under this program, Evergreen raised $48,682, 616 from 320 donars, and working towards their goal of $55,000,000. The current state of the environment is becoming ever-more concerning leading us to look for alternatives in every aspect of our lives in order to reduce the impact of our actions on the environment. At home we try to save water and energy, we separate our household trash and try to recycle and reuse, we are desperately working toward greening our communities, trying to bring nature in urban cities, and empowering each other to find a solutions to reduce our carbon footprint. Sustainable fashion and lifestyle products are also gaining popularity. At Shopanthropic we believe that people can have a significant positive impact on people lives and on the environment through the purchasing decisions they make. While our fashion and lifestyle collection is inspired by the latest trends, we strongly believe that it should also be sustainable. From clothing and jewellery to fashion accessories and home decor our emphasis is on bringing products that are socially-made, eco-friendly, made with recycled materials, organic or natural. Recycling half the world’s paper would free 20 million acres of forestland. Our artisans are not only earning their livelihood but also playing a significant role in saving the environment. Also in our home collection, we have a variety of cushion covers that are all coloured with eco-friendly natural vegetable dyes. Further to this, in our fashion collection you will find scarves and bags that are also coloured with natural dyes and appliquéd with the textile pieces collected from the waste of textile industries. Our jute clutches and shopping bags are environment-friendly. Our jewellery collection includes pieces made with terracotta and pearls. Even our horn and bone jewellery are biodegradable and eco-friendly since the horn and bone used in those pieces are derived from animals which are brought to abattoir for human consumption. 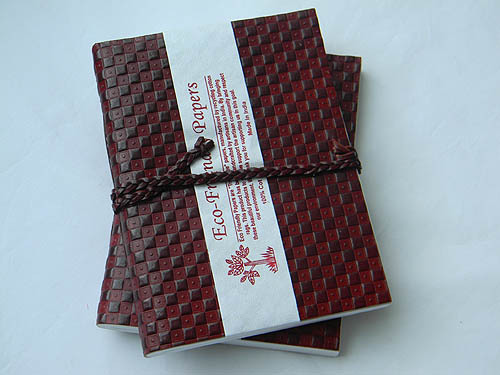 We also have a collection of Journals that are made with tree-free paper and cruelty-free leather making it a perfect gift for eco-conscious consumers. At Shopanthropic most of our products are hand-made and machines are only used where it is required. In our printed products, the fabric used was printed with traditional hand-blocked printing methods and not with machine printing which is also helping in preserving our environment. To celebrate Earth Day 2011, we are dedicating a collection of sustainable products from our Home, Gifts, and Fashion collection to raise funds for Evergreen, a Canadian charity whose objective is to make cities more livable. In the month of April, 25% of proceeds from each sale of products from this collection will go towards supporting Evergreen’s endeavours in greening Canadian cities. From this Earth day onwards start believing in sustainable fashion and lifestyle and help saving environment for ourselves and for our children. This fair trade ‘Preserve Art’ Embroidered Clutch is a part of our Earth day collection. In celebration of Earth Day 2011, we will contribute 25% of retail price of this clutch to Evergreen, a Canadian charity whose objective is to make cities more livable. By empowering communities, by providing innovative resources and by transforming educational values, Evergreen is bringing communities and nature together for the benefit of both. This is a hand-embroidered 100% cotton product. The material of this clutch is printed with traditional wood block printing method and coloured with natural dyes. Besides, being a 100% natural dyed product, this clutch is a socially-made product too. 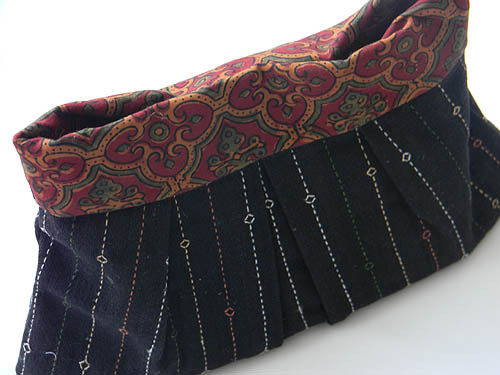 This clutch is made by women artisans from a cooperative in the Kutch region of India. After a massive earthquake in 2001, these artisans are generating income by making hand-embroidered products and rebuilding their community and their families. By purchasing this clutch you are supporting the environment, helping improving the lives of the artisans, and helping us help Evergreen in their endeavours in improving the health of our cities – now and for the future.